Ensuring that a strong and visible commitment to social justice is central to the purpose, identity, and activity of the church. 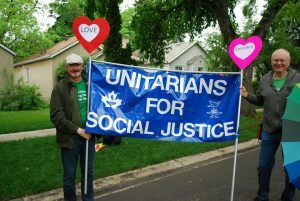 Educating the congregation on issues related to social justice and facilitating participation by members of the congregation in social justice activities. Supporting Indigenous actions, as allies, to protect the environment and to promote land rights, social justice, and human rights. 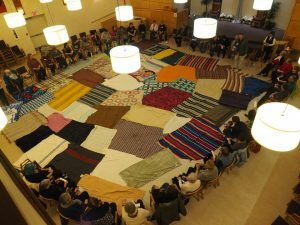 Blanket Exercise On Sunday, January 14, 2018 the congregation participated in a Blanket Exercise as a special, extended morning service. 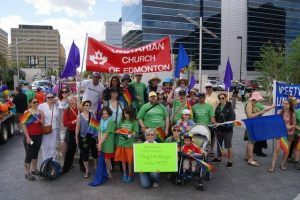 This service was organized by the Social Justice Working Group and was designed to contribute to the church’s focus on First Nations Spirituality during January and February. Originally developed by Kairos, the Blanket Exercise is an activity that helps participants understand the complicated relationships between Indigenous and non-Indigenous peoples over the past 500 years. Over 60 people, including many youth, learned or were reminded of the early intent of treaties, the loss of land, the stripping of rights, the forced separation of children from families and, through it all, the extraordinary resilience of Indigenous peoples. The Blanket Exercise is a step toward gaining the broad understanding we will need to support reconciliation as a congregation and as citizens. We are grateful to Elder Evelyn Day and to Marilyn McSporran and her team from St. Albert Family and Community Support Services and the Michif Cultural and Resource Centre for leading us through the Blanket Exercise.